Renovated playroom at Kapi‘olani Medical Center for Women Children. Specialty polyurethane flooring installed by IPR Hawaii. A hospital is a rigorous environment that places constant demands on the facilities, especially when it comes to flooring. Constant foot traffic and high standards for cleanliness require highly durable, quality materials. The Kapiolani Medical Center For Women & Children is no exception, with one of Oahu’s busiest health care facilities. 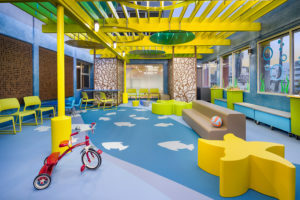 Their recently renovated playroom is a unique example of creativity and functionality in flooring. The room was designed to provide a comfortable and cheerful environment for children to play while visiting the medical center. This required a cushioned flooring material that was also easy to clean and durable enough to stand up to children’s play. Our line of Herculan self-leveling, seamless polyurethane flooring was a perfect fit, meeting all their requirements for hygiene, safety, and fun. The Herculan utility flooring lines we offer are suitable for adhering to various surfaces and ensure a seamless liquid tight finish to the floor. The systems are environmentally friendly with not odor so installations can be done with little disturbance to daily activities. Besides being wear-resistant they’re easy to maintain and available in a variety of colors that can be combined into decorative designs. Please CONTACT US for more information on our specialty flooring and waterproofing applications for your projects!